- Use the maxx lens to search in a snap. See something you like? Take a photo in store (or out & about) & shop similar styles right here. -Explore my maxx matches by selecting the styles you love & we’ll create a personal shop just for you. 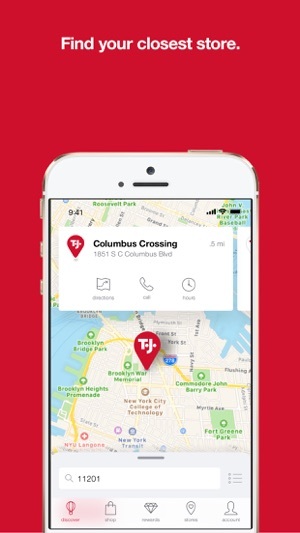 -Use the store locator to find our family of stores near you. -Upload your e-gift cards and Rewards Certificates to your account. 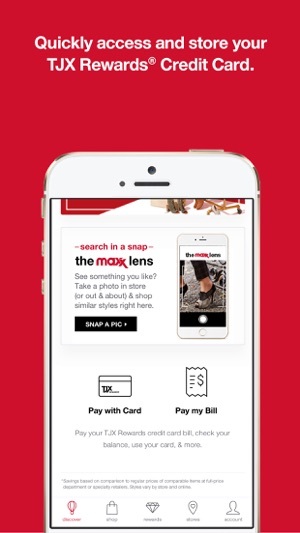 -Manage your TJX Rewards Credit Card account on-the-go. 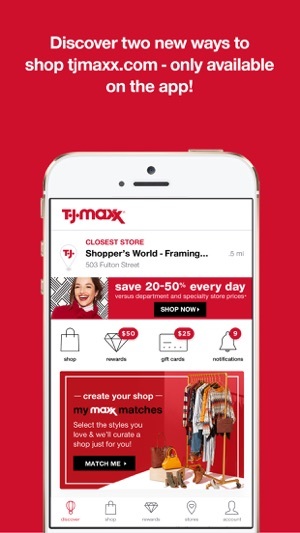 -Register for the T.J.Maxx App to create a mobile account (you can use your HomeGoods App account here as well). The review complaining about not being able to filter searches; the app is just like being in store. Online merch is changing daily just as if you were inside TJ Maxx. It would be literally impossible to put certain things in categories when they’re turning merchandise just as much as the store fronts are. The review complaint about not being able to access your card in store; that’s a safety precaution not only for you, but for the cashiers. With no way to access customer cards that takes away the possibility of credit card fraud made by employees. We all want to believe everyone is honest, but that’s naive. I had an online account prior to the apps release and since then I have had zero issues. My login has remained the same. I will say the online version has more features this app has yet to offer, but it’s still brand new. I love being able to find brand name merchandise for a fraction of the cost and I love the diversity the online market has to offer. TJ will always be my go to! I love the days when there’s free shipping and I love being able to shop and pay my card from the same place! The app had a feature that said I could enter a PIN and it would display my card number. I thought this meant I wouldnt need to carry my card and could scan the card for in store purchases via the app, or I could at least see my card number on the app and pay online. This feature has never worked and never has displayed my card number. I have attempted several times to log on the app to view my credit card account (after the app updated and booted me out and I had no idea what the log in info was as I had used my fingerprint to sign in) and then it told me incorrect information even after I redid my email/password combo. This app is very frustrating and only used to pay my bill, and now it wont even let me log in. Tempted to pay off the card and just stop using it as I have other cards with apps that work easier than this.